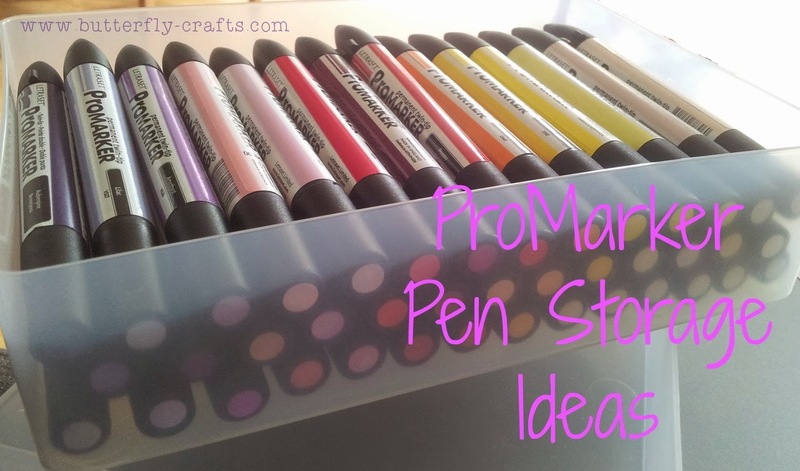 If like me you love papercrafting, it is quite likely you have a lot of pens of one brand or another and you need to find the best way to store them. It can be frustrating and time consuming when you have to search around for the colour that you need because of lack of organisation. I dont have a lot of room for craft storage (this will change in our new house!) and so I took to searching online for different ideas for storing my ProMarkers. This fabulous storage tower has been handmade using cardboard and mount board, it must have taken ages to make and to have all of the colours in the right place. I like it for easy access however it does seem to take up un-used space whilst a collection grows and what if more pens were added in the range? This storage box has been made from a travel CD box with smaller individual boxes made to go inside so that colours stay in rows. I think this is a good option as the pens are stored with the ink flowing into the nibs and it is easy to transport around if necessary. 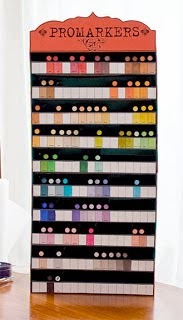 Thinking about the different options for storage that I have, I decided that my ProMarker collection is not huge (because I also have Spectrum Noir) and so a couple of clear boxes would be plenty for me. Something I have picked up on from looking around Pinterest for Craft Room ideas is that it is a good idea to put coloured dots on the end of the pens so it is easy to work out what you are looking at. So I got a couple of packets of small white labels and then coloured them in and popped them on the fatter pen lid. I have two boxes arranged in colour schemes - one for blues, greens, greys and the other for pinks, purples, reds etc. Ok so I can't see the pens instantly like these two examples above, but it does help more than just randomly being in a box! How do you have your pens arranged?